I love to surprise my kids with a delicious strawberry-inspired after school snack! 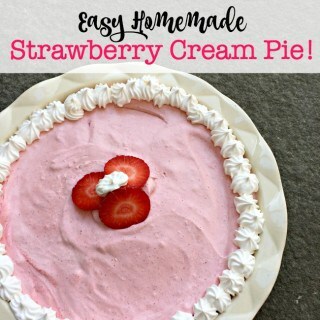 This easy homemade Strawberry Cream Pie absolutely fits the bill! *Or you can use a purchased graham cracker crust! Mix together the graham cracker crumbs, sugar, and melted butter and press into the bottom and partially up the sides your pie dish using the back of the spoon. Bake in a preheated 350-degree oven for 5 minutes. Remove and allow to cool. Place the sliced strawberries, ½ cup sugar, and vanilla extract in a saucepan and bring to a simmer under low heat (about 5 minutes), stirring constantly. Add in the cornstarch and continue stirring until mixture becomes thick and bubbly. Remove from the stove top and blend the strawberries to a smooth consistency. Allow to cool for a few minutes. In a large bowl, empty the contents of the tub of Cool Whip, and then fold in the strawberry mixture. Pour pie filling into the prepared graham cracker crust, and chill in the fridge for 6-8 hours to allow the pie to set.